Standard room amenities : PPV movies, cable TV, free high-speed Internet access, hair dryer, in-room safe, iron, telephone with voice mail. Hotel amenities : Guest services, laundry, luggage, maid service, safety deposit box. 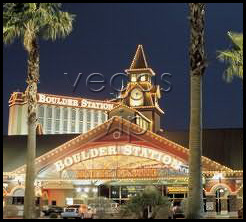 Boulder Station is only 7 miles from McCarran International Airport and is conveniently centrally located near many Las Vegas points of interest. 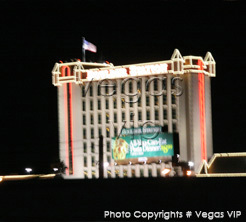 Its 300 luxurious hotel rooms are easily accessible from the wooden walkway that encircles the casino. Each room is elegantly appointed in the Victorian style that mirrors the theme of the entire property. The casino is comprised of an extraordinary 75,000-square-foot gaming floor surrounded by restaurants, lounges, shopping and attractions. The resort's wooden floors and brick columns display a rustic, comforting appeal that makes guests feel like they're at home. Dining choices are plentiful, ranging from the traditional Mexican fare of the Guadalajara Bar & Grille to The Feast Gourmet Buffet, a smorgasbord of freshly prepared dishes including waffles and flambé for dessert. For a more quiet and intimate atmosphere, diners can enjoy fine steak at The Broiler or Italian food at Pasta Palace, where guests can also order unlimited pasta bowls. The Railhead, a centralized lounge, offers cocktails, dancing and an occasional live blues performance. The Regal Cinema complex is one of the finest movie theaters in town, with the latest advances in film presentation, comfortable seating, spacious auditoriums and a friendly staff aiming to make any night at the movies an unforgettable one. And the Kid's Quest youth activity center presents a fun and dynamic playground for children to explore while their parents enjoy the hotel's adult diversions.